Hello, I'm Baoshi's mommy. Baoshi Meili is a six month old Shih Tzu. To me her coloring is "cream", but I guess the standard only lists "white" (at least for AKC...I'm in the US). I also have an eight month old Papillon named Bijou Jolie. 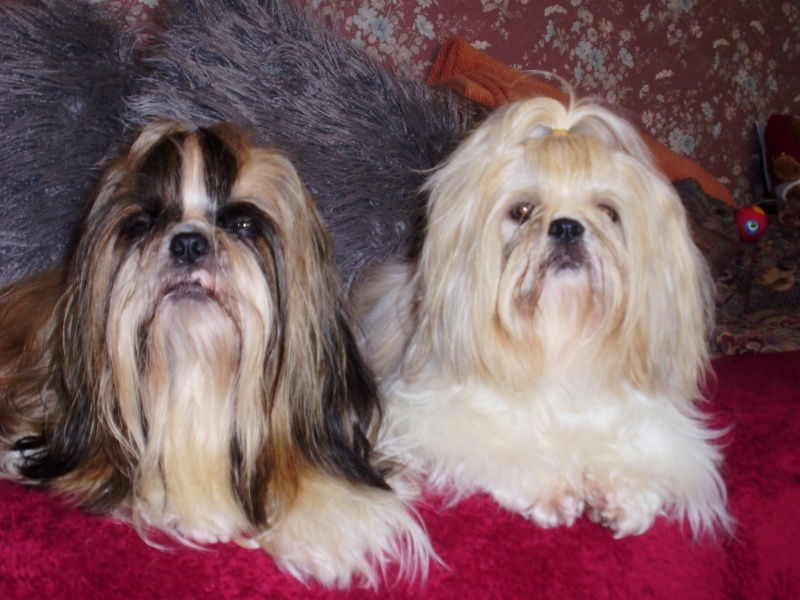 Glad to be here for some insights into the breed since I've never had a Shih Tzu before, or even a friend with one. Her favorite "thing" is to make her toys sqeak. She is the most subborn dog/puppy I've ever seen. She loves to be around me but is usually not crazy about being held for very long. She loves to play...with me and on her own. So cute when she lays on her back with a toy between her front paws. She is very social and seems to like everyone though she doesn't like people who try to pick her up without making eye contact and saying something to her first. So far she is no harder to groom than my Maltese Pansy (RIP) was, but then she is only six months old...we'll see. I'm not sure a Shih Tzu and a Papillon were the best choice for sisters because their "play styles" are so different. Bijou (Papillon) wants to chase; to dart in and out. Baoshi wants to wrestle. I haven't let them go full tilt at all yet. I watch them closely as I'm afraid Bijou (fine boned) could get hurt. (Baoshi is 6 lbs and Bijou is 4.5 lbs.). I'm sure it will work out as I've seen youtube videos with Paps and Tzus as siblings with no problems (perhaps I am overly cautious). I will have to watch myself with Baoshi. She seems to want to be alpha, or maybe is really just very confident, very boisterous. She is so cute it's going to be hard not to totally spoil her. She has so much expression in her little face. Her eyes change with her mood but so does her mouth. I'm trying to figure out what these different "mouth poses" are all about. One looks especially stubborn...jutting out her chin more than usual. Sometimes her teeth show and it looks like she is relaxed and happy...almost smiling. She makes the cutest sounds! Sometimes, weill I can't really describe it, it reminds me of a pigeon or some other bird. She seems to do this rather than whine as other dogs do. It also sort of reminds me of a cat purring but it's louder with a sort of "trilling sound" to it, like when people can roll their rs. Anyone else's dog do this??? hi and welcome from me and ruby, there is always someone on here to help with any advice you need,they have been fantastic with helping me with any advice iv needed for ruby. OMG she is adorable - and looks so like my Isabella although Isabella is just a tad darker so is gold and white. They do come in cream whatever the American KC says.... I am surprised really because in the US they have SO MANY other shades where as here we have gold black brindle white or grey though there are far more shades than that. I might have got it wrong about AKC colors, I should recheck that. Her ears are darker than they appear in the photo and I think she's getting a "saddle" as well. She started out light and is getting darker though I thought it was usually the other way around. Oh, and thanks, she is adorable:) I love her little button nose. I'm hoping someone else's dog/puppy makes this weird trilling/pigeon sound, it is so cute and I've never heard it from a dog or, well, anything else for that matter. I'm hoping it's not just a puppy thing, I don't want her to outgrown it, lol. Oh, and yes, she has given me that lookl. Sort of like "you've got to be kidding me!" Also, she has the most flexible neck I've every seen. She can stand with her back to me and tilt her head so far back I think she can see me without turning around....kinda weird! Oh....also, I forgot about the "pout"...first the pout face, then the flop down, all four legs seem to fly out from under her all at once, especially on a walk when she is ready to go home! Hi Baoshi's mommy and welcome to Whispers. It sounds to me as if you are getting to know Baoshi very well! She looks gorgeous and a lovely colour as well. Any questions just ask away and someone will soon be along to help. We love to see photos as well, so the more you upload the happier we will be! Yes you are STILL describing a normal shis tzu I remember when I had my first (who was also cream though classed as gold and white) I thought she had all these UNIQUE characteristics then found out she was behaving like all the others - although when you have different lines and different generations in your company you can see which traits are unique to that line - it is absolutely amazing and YES Isabella makes the pigeon noises. They are the MOST intelligent breed of dog I have ever encountered though sometimes people think they are stubborn and untrainable... but that is because they think things out for themselves and don't understand why they should repeat performance of atrick they already know. They believe they are cleverer than humans and they are probably right sometimes I watched one of my dogs logically try working out how to reach something for over an hour once... it was absolutely amazing to see him thinking things through! Baoshi's mommy wrote: I might have got it wrong about AKC colors, I should recheck that. Her ears are darker than they appear in the photo and I think she's getting a "saddle" as well. She started out light and is getting darker though I thought it was usually the other way around. Oh, and thanks, she is adorable:) I love her little button nose. Isabella looks so innocent in that photo! Where have you hidden her little devil horns? And you are so right about how intelligent they are. It is so much fun watching them work things out for themselves, or rather working out how they can get you to do exactly what they want you to. isabella is a beutiful colour,thats just the colour rubys mum was and her dad was grey,gold and white just like ruby is.they are very intelligent for a small dog,ruby has a couple of the nina ottosson puzzle games for when we have to leave her for an hour,and within minutes she worked out that she had to pick the bones up and spin the top round to get to the treats.she loves playing with them. Thank you Sujay...not sure if that is your name or your dogs! Either way, your dog is very, very cute! Simbalove...is Simba the dog's name? He (she?) is beautiful. I do like the markings around the eyes, very pretty. I double checked and the AKC has lots of color combos, but no cream, only white &..., black & ..., etc. ; no cream. Oh well. LOVE the big photo. Isabella does have coloring close to Baoshi's, though it is more golden I think. I remember reading the gold is supposed to be similar to a golden retriever's coloring and Baoshi's definately is not...not yet anyway I guess it might change, brighten, darken. It's really more tan than gold. I wonder when the colors "stabilize". You're scraing me a bit regardiing the intelligence of them. I thought maybe I was imagining it! My Bijou (papillon) is very, very smart. But Baoshi is intuitive and I think, like a cat, she could do "whatever" if she wanted but doesn't always want to. She gave me a HUGE scare today. It's beautiful here today, so we went for a long ride (car seats are ordered but not here yet.) We went for a walk around the culdesac when we got back. So pretty with the little pond. Potties outside all around, tons of praise, etc....headed home and stopped at the mailbox and I looked down & Baoshi's leash was 1/2 off! I tried to get her to stay but I think I scared her, lol. (I was a bit freaked out:) She kept backing away from me and turned and went home; which wasn't far but it still scares me. Poor baby, tail between her legs and ears down. These are townhomes so lots of cars around! She went right to the door thank goodness. Now I've got to find a better harness. I really like this one. It's leather and rolled (rounded) so it's better for long hair. It's a stepin, then you push a narrow "slidey" thing down and a 2nd, bigger bone shaped slidey too! Should be secure but obviously not! Any recommendations? Sorry, I said her leash was 1/2 off...I meant her harness was 1/2 off. :I have loved reading your posts because it tells me that you are absolutely addicted to your new breed and you are understanding her as well as allowing her to develop to her full potential xxxxx" I think this is because she is so interesting. Although I love my Bijou just as much. It's surprizing though, I thought Baoshi would be the lap dog and Bijou would be active all the time. Bijou is the lap dog, very active yes, but she LOVES to be on my lap for hours sometimes. Not Baoshi. She will cuddle and be held for a bit but then she wants down to play but stays nearby. Which is fine as I only have one lap! I hope I remembered to compliment all the doggies, they are all so cute, pretty, adorable. I've gotten so I like all the colors and markings, it makes the breed very interesting. Even though the coloring can be so different, they all look so similar with their cute little faces. You will soon learn that Shih Tzu's do things on their terms. It's just that they look at you with those huge eyes and you melt! Never underestimate the intelligence of a shiddie. As Baoshi grows and gets to know your routine you will be amazed how much they know. They never stop learning and will spend hours working things out for themselves. It sounds like you had a real scare with the harness, but at least Baoshi had the sense to go home and wait for you. The name of my dog is Simba and my name is Sue by the way. Many years ago when I was working there were two of us called Sue so it was easier to call us Sue with our other initials, so I became Sue J, which then led to sujay as the name I use on forums. Simba was actually bought for my Mum who had a stroke to keep her company when Dad has to go out, but it is Dad and I who do the work with him. Mum just has the fun bits of sitting and giving him a cuddle when he settles on her lap! He is a real comfort to her and like all Shih Tzu has a massive personality. None of my dogs have been called Simba though my beautiful cat was called this many years ago and so when I qualified with my dogs to allow me to have a kennel name (years ago you had to breed a dog good enough to win at shampionship level before you were allowed a kennel name (affix) whereas now anyone can have one ) I decided to pay homage to my lovely cat who I had lost shortly before I bred my first litter. There can be very very many shades of gold starting with almost pale fawn through bright gold to deep red gold. One of the colours that changes throughout the dogs life is the brindle which can start out looking like gold but if you look carefully there are black hairs intermingled (not just black tips like you see often on the gold coats). These coats fade to grey as the dog matures but later in life can darken to become almost and even black! Black can stay jet black (and you can tell this by the blue tinge to the skin as a puppy) or pale to grey also. Ok, now I see. I'm glad there aren't two Simbas, lol. So it's Josh and Isabella then, and Simba and Ruby. And all the background info is interesting too...stuff about the kennel names, etc. Yes, I was surprized to see how active Baoshi is since I had read that Shih Tzus were good for seniors (not that I consider myself one yet:) and that they are very laid back. I suppose they must mean after the puppy stage. She can be a handful, now anyway. I know everyone here is a Shih Tzu lover and * do love Baoshi, but as I've said I love my Papillon Bijou just as much. I look at them and think how lucky I am to have two such sweet furbabies:) I admit though, there is something unique in the Shih Tzu personality...I can't put my finger on it. Are they a tad more like humans than other dogs or is it my imagination? Not all the time of course, but sometimes she really seems ... I don't know, I can't describe it. Bijou is sweet, smart, affectionate, sometimes she seems a bit cat-like in her play (likes to use her paws) but she never really surprizes me except she is quick to learn. Baoshi surprizes me often. Her reactions seem different from dogs I've had in the past somehow; like I said not always but once in a while. I'm going to see if I can figure out how to attach a photo of Bijou here...and one of Baoshi a little bit younger. You are so right when you say that they are like little human beings on times! And as Baoshi grows up you will see many more traits coming out in her that will make you think she is a human on four paws! Once she has reached maturity she will have everything sussed out and will often do something before you have told her to, because she knows so much about your routine. I am glad Baoshi seems to be getting on so well with Bijou, as they grow up together they will be good friends, but still come to you for cuddles as well. Have a look here for help with uploading photos, and if you need any help just ask. Thanks, I'll look at it. Posting the Avatar photo was easy, but it seems photos within a post are done differently. Oh....I was wondering if the photo at the top of the page is Josh? I love the expression on his face!